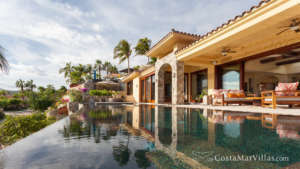 This exquisite beachfront villa is situated in the exclusive Corridor of Los Cabos. 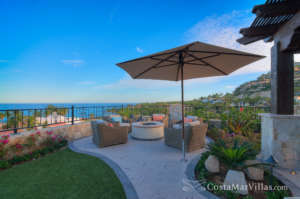 Part of the Villas del Mar at Palmilla resort development, the vacation rental includes complimentary access to the amenities at Club 96, Espiritu Resort, and the One & Only Palmilla. 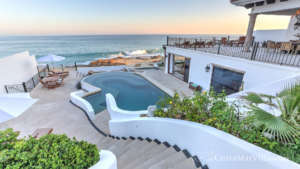 The villa itself combines the finest elements of vintage Old Mexico and contemporary luxury, with three bedroom suites providing comfortable accommodation for six and a professional staff that includes a chef, butler, and housekeeping. For families and groups of friends desiring stylish privacy and resort pleasures in the heart of Los Cabos, Villa 431 is an ideal choice. Perched directly along a white-sand beach, the villa commands panoramic views of the Sea of Cortez from its lower and upper terraces. Enjoy mornings and afternoons plunging into the pool and savoring cool refreshments on elegant loungers. Fire up the grill in the afternoon, relish an alfresco feast, and sip delicious local cocktails in the veranda. At sunset, crawl into the elevated hot tub and admire the extraordinary hues of the horizon. Glass doors inhale the ocean air into the open-concept interior, where the gourmet kitchen serves a breakfast bar, six-person dining table, and sitting area. The décor combines fresh white finishes with rich timber ceiling beams, terracotta tile floors, and choice touches of exquisite ornament in vintage Mexican style. All three bedrooms feature ensuite bathrooms, ceiling fans, air conditioning, and TVs. 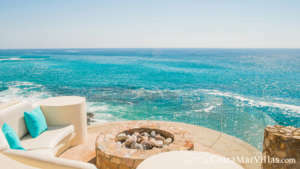 The two master suites include king beds and ensuite bathrooms with stand-alone showers and tubs, and both open to a spacious, upper-level terrace with extraordinary ocean views. The guest suite has two twin-size beds. Beyond your private haven at Villa 431, be sure to visit Club 96, Espiritu Resort, and the One & Only Palmilla, where you’ll discover an outstanding array of dining options, wellness facilities, and amenities for relaxation, sport, and play. For world-class golf, head to nearby Palmilla Golf Club or El Dorado Golf and Beach Club, and don’t miss the nightlife and charming colonial architecture of San José del Cabo. Less than twenty minutes to Los Cabos International Airport, Villa 431 is a convenient base for destination wedding guests or easy weekend escapes.